Premier source of high quality original articles on latest research dealing with various aspects of Real Estate Valuation, Real Estate Markets Analysis, Real Estate Management and Administration, Real Estate Development and Finance, Real Estate Econometrics and Statistics, Property Investment and Marketing, Business Decision Process in Real Estate, GIS in Real Estate Market. Over twenty years of experience in publishing original interdisciplinary articles dealing with various aspects of real estate valuation and property management. The articles published after double-blind peer review provided by minimum two subject experts. High level of research (only original papers published). 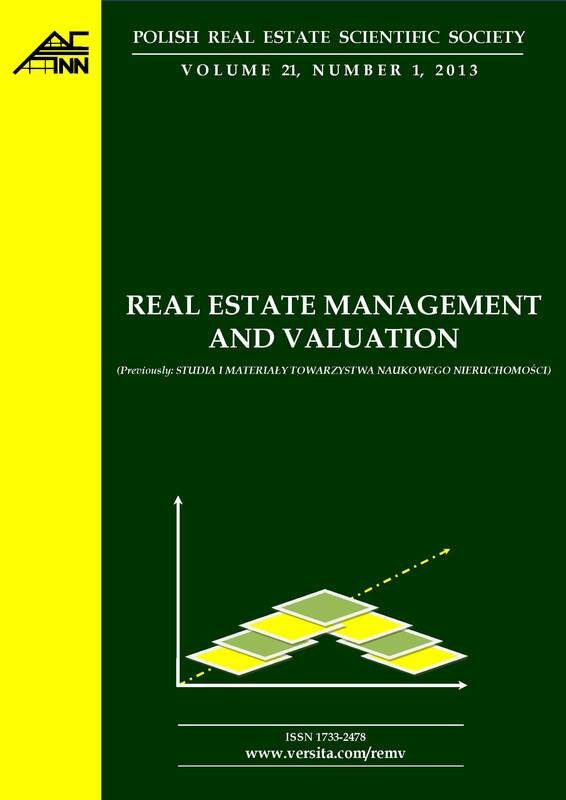 By reading and subscribing to Real Estate Management and Valuation it will be a good opportunity to be in connection with the most important issues related to real estate area of research. Increase your international visibility and research potential by meeting contacts and colleagues in the wide community of scholars and researchers. Submissions accepted in a broad range of scientific areas related to real estate valuations, analysis, investment and property management. This journal has been on the Polish Ministry of Science and Higher Education's list, since the first issue. All authors receive very fast and comprehensive peer-review.